As the ongoing weather chaos across Britain continues to dominate the news, there is a great deal of chatter about how it is all affecting the perception of our political leaders. Less than a week ago pressure was beginning to mount on the Prime Minister regarding when he would even visit the areas suffering from flooding, having been beaten to the Somerset Levels by Prince Charles on his flood wagon. Now, just days later, in addition to the misery of having their homes washed out, flooding victims have to put up with the ultimate indignity of welly-clad politicians striding gallantly to their ‘rescue’. Politicians all of course want to be seen as taking charge of the situation. For Mr Cameron he also has the salutary lesson of the electoral consequences of a major weather event for President Bush who, whether fairly or not, got it in the neck over Hurricane Katrina. Whether Government attempts to address the situation are in fact futile have received a lot of debate in recent days, and people are genuinely divided about it. When ComRes asked the public about whether there is little the Government can do to minimise the effect of something as powerful as the weather, almost the same number agreed there was little it could do (43%) as disagreed (44%). But this does not mean the Government can get away with doing nothing. In fact, many people think it can do much more. Even when prompted with specific Government proposals, such as sending in the army and providing £150 million of funding over the next two years, fewer than a quarter of Britons (23%) think that the Government is doing enough to help with the flooding. Nearly half (44%) think that it is not doing enough, leaving the NET rating for the Government’s efforts at -21. This drops to -33 among those living in the South West, where the flooding began and most people (52%) think the Government is not doing enough. Whether Mr Cameron's "money no object" pledge is enough to shift this opinion remains to be seen. It's not that people don't like intervention - 71% think helping with the flooding is a good use of army resources – it’s just that they think more can and should be done. 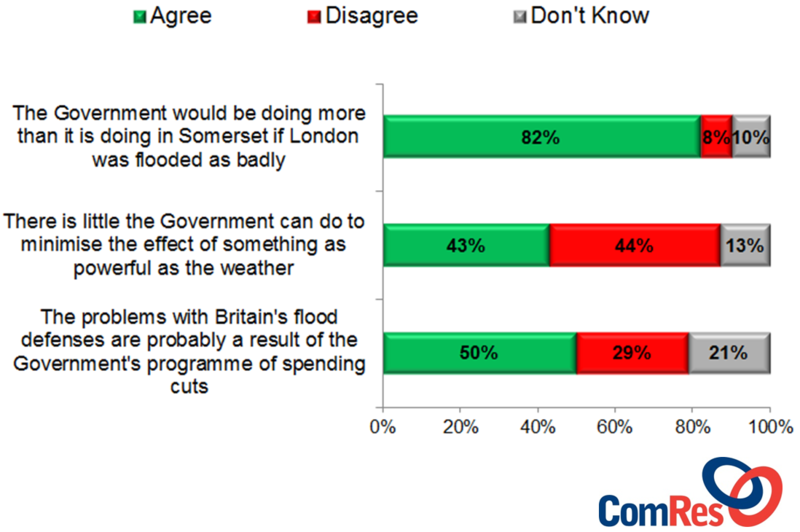 For example, an overwhelming 82% of the British public think that the Government would be doing more than it is doing in Somerset if London was flooded as badly. Just 8% disagree. This again suggests a view that the Government could do more if it wanted to. Although a crisis can offer opportunities for the man in charge to appear like a rock of stability, the Prime Minister has still faced challenges from other politicians looking to get in on the action. For example, Nigel Farage’s demand that the UK’s foreign aid budget be spent on the flooding chimes strongly with the popular mood. 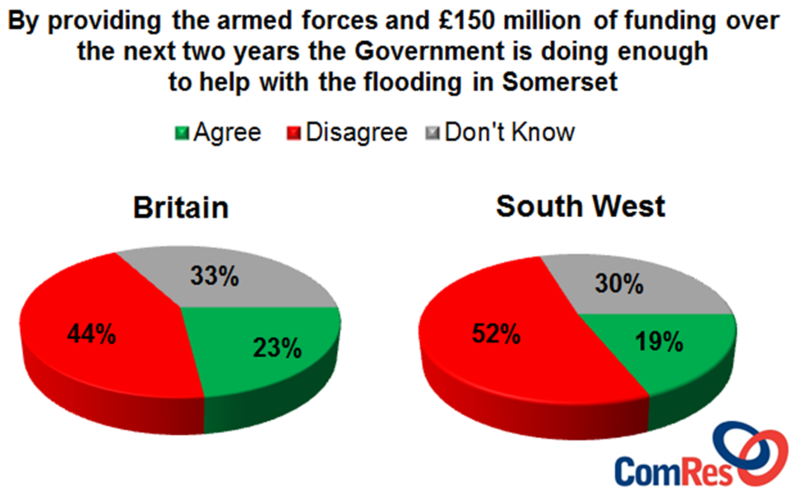 ComRes polling for ITV News and splashed by the Daily Mail yesterday, shows that three quarters of British adults (73%) agree that money currently spent on the UK’s foreign aid budget should be diverted towards dealing with the flooding in Somerset. But perhaps most worrying for Mr Cameron is that half of Britons (50%) think that the problems with Britain’s flood defences are probably a result of the Government’s programme of spending cuts. Although 29% think this is not the case, while debates about dredging and pumping continue, the spectre of Government responsibility for the crisis lingers in the air. It also gives the Government’s enemies the potential to attack, saying that drastic cuts in the short term only cost more in the long run. But however futile one thinks it is to try and tame nature, the problem is not expected to go away by itself. Two thirds of Britons (65%) think that the weather in the UK seems to get worse every year. Given the forecast for the next week or so, they could be right.